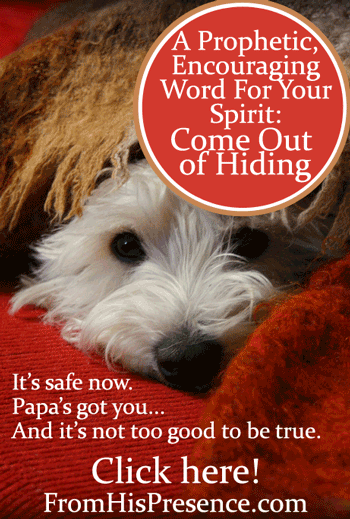 Today’s blog post is a prophetic word for someone’s spirit. I’ve had the phrase “It’s okay to come out now” (relating to someone’s spirit) burning in my spirit for a couple of weeks. Then I started listening to a song (see the YouTube version below) that went along the same theme. And I feel like the Lord wants me to speak to some people today who have been wounded; people whose spirit has gone into hiding as a safety mechanism to cope with pain. “(Your name here), your spirit has been hiding. YOU have been hiding. But I want you to know that it’s okay to come out now. It’s safe. Your Father has brought you into the Kingdom of the Son of His love (Colossians 1:13). I know you’ve never known love before. You’ve placed yourself behind so many barriers because of that lack of love that you’ve experienced your whole life. But you were in darkness back then. Now you are in the light. That is why it’s safe. It’s okay to open up. It’s safe. Will things always be perfect? No, but you will always be loved, and you will always be safe in the Father’s arms. Your Father in Heaven will always love you, and so will those whom He has placed in your life. It won’t hurt. So open up your heart to receive. Open your heart to fully embrace that which your Father is giving you in this season. It’s okay to come out now. It’s okay to embrace this new life. It’s okay to trust that you can love and not lose. Precious friend, I know it can be hard to look at what God is offering you and believe it can actually be yours. BUT IT CAN BE. Christ gave His life so you could inherit the FULLNESS of His Kingdom of love. You CAN be everything God created you to be. You can walk before God in white, in the purity and holiness of Christ. You can be the man or woman of prayer that God created you to be. You can be so saturated with the Word of God that you don’t sin. You can enjoy a sweet, beautiful relationship with your spouse. You can enjoy covenant friendships with people who would be willing to give their lives for you and for whom you would also be willing to give yours. YOUR house can be filled with peace. YOU can be filled with joy. So it’s okay to come out now. It isn’t too good to be true. Let yourself love. Let yourself trust. Ask God to help you take down the barriers you have put up over the years to shield yourself from the pain. Do you need to come out of hiding? Do you need to let yourself love, be loved, and trust? “Heavenly Father, I come before You in Jesus’ name. Thank You for loving me. Thank You for saving me and filling me with Your Spirit. Abba Father, I need help. My life has hurt for so long that I have put up barriers to shield myself from the pain. I’ve been hiding, and whenever people get too close, I come up with reasons to push them away. I haven’t trusted because it has hurt too much to trust before. Heavenly Father, I’m sorry. Please forgive me for harboring evil suspicions in my heart. Please forgive me for not believing You when You said that You make all things new. Please forgive me for holding my own past and other people’s past against them–and against myself–when You said that in Christ, we are new creations. God, I choose to let go. I choose to open my heart today. Please help me. I plead the blood of Jesus over every evil suspicion and wall of distrust in my heart. I renounce agreement with them and I repent for holding onto these lies. Please forgive me. Cover me with the blood of Jesus and wash me clean. Fill me with the Holy Spirit where those things were. Abba, in Jesus’ name, please help me to see people and situations the way You see them. Please help me to believe You in all things. Help me to embrace this new life You have given me, and help me to step out in faith, knowing that You will perfect all things that concern me. Papa God, I know I am safe in Your arms. Please give me revelation and understanding of that at the very core of my being. I love You, Father, and I desire to walk in EVERYTHING You purchased for me with the blood of Jesus. Make me humble before You. Help me to receive Your love, love You back, and love others. May you be blessed with grace and peace from our Father and our Lord Jesus Christ, and with fellowship with the Holy Spirit today. Did this post speak to you? If so, I’d love to hear about it. Please leave a comment below. You always have a timely Word! The last couple of posts have been so empowering and comforting. Thanks for being obedient and sharing. May our Father always keep your cup filled and full so that others may be able to drink deep and pour out into the cups of others. I am seeing more and more people referring to God as papa or daddy. I have to say I think it is disrespectful. God is our Holy Father, emphasis on Holy. I really don’t feel we should get too familiar or comfortable in calling Him anything else that disrespects that title. Hi Flo. Thanks for reading. I disagree that it’s disrespectful. Did you know that what God is called in the Bible–“Abba Father”–is the Hebrew term of endearment for “Daddy”? It’s not a formal word at all, but the title of a beloved, adored, cherished Heavenly Father. I encourage everyone to seek after knowing Him in that way. Of course He is holy; but knowing Him as Abba doesn’t diminish His holiness or our understanding of it. Indeed, the closer we draw to Him in genuine relationship, the more in awe we become of His holiness and all His other traits. But He chose first to manifest Himself as Father–Abba Father–through His only begotten Son, Jesus. He longs for an intimate relationship like that with each of us, and in our hearts dwells the same longing. Great timely word Jamie. It really spoke to me. Thanks. I’m so glad, Sarah. Thank you for reading, and for letting me know! Have a great day! I’m a new fellow Bud. SO encouraging! Thank you, I needed this today. I pinned this a while back. I just read it today. I was in tears, especially listening to the song. He’s my Father alright! And I like Abba, poppa…just fine. I did think it was disrespectful myself but I know different having a more personal experience with Him. I know He longs to know His children as closely as an earthly father, that is where that comes in, the relationship to their earthly father determines their view of God, strict, overbearing, abusive or even caring but detached. He can work it out for anyone. He sure can. He’s such a good Daddy, isn’t He? I’m so glad He touched you today. May He continue to comfort you and lift you up! Thank you for reading! This has spoke to me in volumes. Especially when I got to the prayer, tears just flowed continuously and unexpectedly it’s like my healing took place in the areas that were unknown to me. Praise God! Thank you your blog is such a blessing I’m so glad I found it. This hit me in the bullseye. Thank you.
? 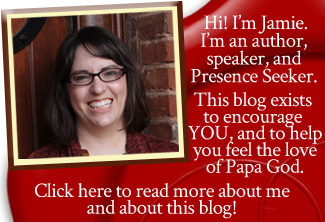 I always love Jamie’s anointed messages from Papa. Keep it coming! I love the songs You post as well. May You prosper in all You do. Robin, thank you so much for reading and for your lovely encouragement. I so appreciate you. May Papa God bless and encourage you today. I haven’t seen you around much lately but I hope to see you soon! Will you be coming back to prophetic roundtable this fall? I hope so! Love to see you there! I use to be a monthly partner with your ministry but I’m no longer getting any of your blog posts and when I tried to join again to support you monthly it says my email is already in the system. I miss not receiving your posts/prayer requests. Hi Gwynne! Great to hear from you. I hope you’re well. I looked you up in my MailChimp system and you are still on my mailing list. Could my emails possibly be going into your Gmail spam or promotional tabs? Please let me know. Also, I looked you up in my Gumroad system (the shopping cart for partnerships) and it shows your same email address. I believe it wants you to sign into your old account under the same email address. Then it will let you sign up for a new partnership. The link for the partnership is here: https://gumroad.com/l/XFRmw and you can just enter whatever amount you want, then hit checkout, and it will be automated each month. Thank you ever so much! Please let me know if you don’t find my emails in your other Gmail tabs and I’ll try and figure out what else could be happening. I thank you so much, this was something I need to read and hea. Iced from the title all the way to the end. I think I need this. The people who have hurt me, robbed me, damaged me and made me build my walls were in my own family. When I moved by myself after my divorce, I was so frightened to be alone and locked all the doors every night. But those who hurt me and robbed me were my family. No locks on the doors prevented that. For me, this is a process. LIke peeling an onion. Layer by layer. He is healing me. Thank you for sharing this. It didn’t heal me….but it encouraged me to keep taking off those layers. And don’t hide. My Abba loves me.